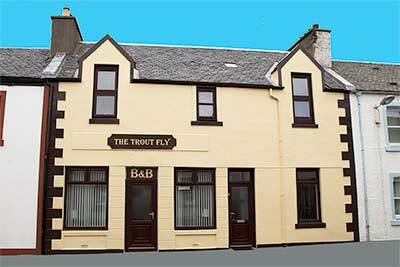 In The Trout Fly Guest House we offer you warm Islay hospitality in the centre of Port Ellen, minutes from the ferry terminal and only three miles from our local airport. We offer 3 twin en-suite rooms as well as 1 double room with private bathroom across the landing. There is also a residents lounge for you to relax in with television and tea/coffee making facilities. Free wifi is available throughout the building. We are situated close to our local distilleries of Laphroaig, Lagavulin and Ardbeg and also to our local RSPB Reserve and American Memorial Monument both in the Mull of Oa. Port Ellen is a picturesque village surrounded by beautiful beaches and has a working harbour which accommodates ferries, cruise ships, local fishing boats and also a yachting marina.